Just in time for the holiday shopping season, Apple's Beats by Dre offer runs from Dec. 3 through Dec. 28 at U.S. Apple Store locations, online at Apple.com and via phone order. Customers will receive their $60 iTunes Gift Card upon checkout or in person at brick-and-mortar stores. 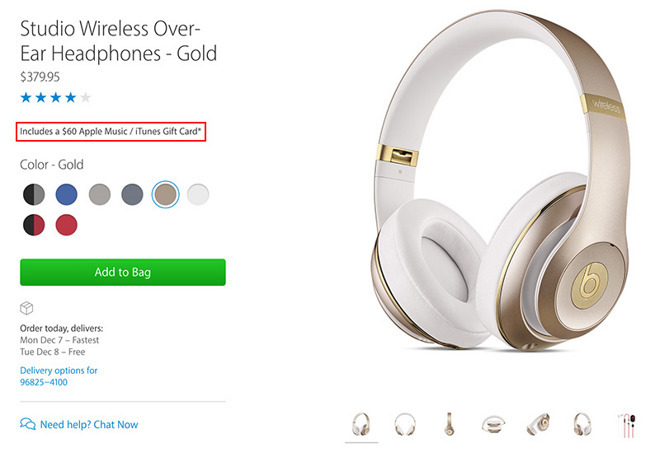 According to Apple's terms and conditions (PDF link), qualifying Beats by Dre purchases include Beats Pro Headphones, Beats Studio Headphones, Beats Studio Wireless Headphones, Beats Solo2 Headphones, Beats Solo2 Wireless Headphones, Beats Powerbeats2 Headphones, Beats Powerbeats2 Wireless In-Ear Headphones, Beats Tour2 Headphones and the Beats Pill+ Speaker. Aside from moving Beats merchandise, Apple is using the promo to boost Apple Music subscription numbers. Dubbed an "Apple Music / iTunes Gift Card," Apple suggests shoppers put the $60 toward a paying Apple Music membership, which at current prices affords potential subscribers six months of free service, or four months when selecting a six-user family plan. Apple has been looking for ways to juice adoption of its fledgling streaming service. In October, CEO Tim Cook revealed Apple Music had at the time more than 6.5 million paying subscribers, with another 8 million testing it out.